People experiencing homelessness have many of the same worries everyone else has, including finding quality child care for their little ones. A new program at People’s Emergency Center (PEC) is giving these parents the extra help they need. Piles of research over the last few years make it clear that a nuanced range of traumas (including poverty and homelessness) in childhood have significant mental, emotional, and even physical effects on survivors throughout their lives. Children experiencing homelessness have an even greater need for expert care than peers who are housed, but their families are also the ones facing the most obstacles to enrolling in a good Early Childhood Education (ECE) program. “Finding childcare for someone who is resourced and has transportation is difficult,” says Roslyn Edwards, who currently helms the Building Early Links for Learning (BELL) program at PEC, so imagine how much harder that task is if you’re not sure where your family is sleeping tomorrow. BELL is a collaborative initiative based out of PEC. It formally launched last winter, after a few years of planning and research funded by the William Penn Foundation. It’s now funded through 2020 thanks to a $1.4 million grant over three years from the Vanguard Strong Start for Kids program. BELL has two related focuses: helping families enroll in high-quality ECE programs, and partnering with emergency housing providers to improve housing environments for kids under five—a group rarely targeted for best practices when it comes to shelter environments. How many individuals, families, or children are homeless at any given time in Philadelphia? That number is nearly impossible to determine, but research from BELL partners estimates that close to 2,000 children spent at least one night in shelter or transitional housing in a 12-month period. Why is the number of people and families experiencing homelessness so hard to pinpoint? Partly because, as a project like BELL helps to demonstrate, homelessness rarely looks the way that those who have never experienced it might think it looks. “Everyone is aware of the chronically homeless who may be living on the street, because people see them. But that’s just the tip of the iceberg in terms of the homeless population,” says PEC president Kathy Desmond. Often, homelessness is invisible to the general public. Maybe two families are forced to “double up” in housing that is sized for one family, or people who might otherwise be on the street or in a shelter crash on friends’ couches. Others might live out of their cars. Many of these people don’t meet strict federal definitions of “homelessness” and are therefore ineligible for associated services—and often go uncounted. And “not everyone who is experiencing homelessness is also jobless,” adds Edwards. Many of them are working (hence an urgent need for childcare among this population). And, she continues, everyone should remember that there are many reasons people can suddenly find themselves out of a home: domestic violence, accidents, job loss, and mental or physical health problems can all play a role. For parents of young children experiencing homelessness, the primary barrier to quality ECE is the cost, which Edwards estimates can total up to 20 percent of the average person’s income. Transportation is another challenge. And, of course, the stress of homelessness leaves little mental space to research childcare providers and tackle the enrollment process. “If a family is distracted by getting their feet settled, it’s hard to dig deep into [questions like] where do I start, what does ‘quality’ mean, are there vacancies?” Edwards says. BELL can do a lot to help. Part of its job is staying in touch with childcare providers convenient and suitable for families in the city’s 18 shelters, for an accurate and up-to-date view of services and enrollment. It works one-on-one with parents, helping them understand the importance of ECE, find a good program, and enroll. ECE specialists on staff at PEC are there for parents in shelters, “to answer questions and hold their hand if necessary, all the way up to going with them to enroll their child,” Edwards says. They also facilitate enrollment in federal Early Head Start and Head Start programs. And if PEC staffers notice a trend of questions from the parents it serves (like trouble with breastfeeding, for example), they can coordinate dedicated sessions in a safe environment. Desmond hopes that early interventions can help mitigate or heal children’s trauma. “Part of what we’ve been trying to do with the BELL project in particular is really look at the trauma of shelter environments on children,” she says. Some shelters have “congregate care” settings, with more than one family living in a large room at one time. The noises and lights are especially hard on babies and young children. 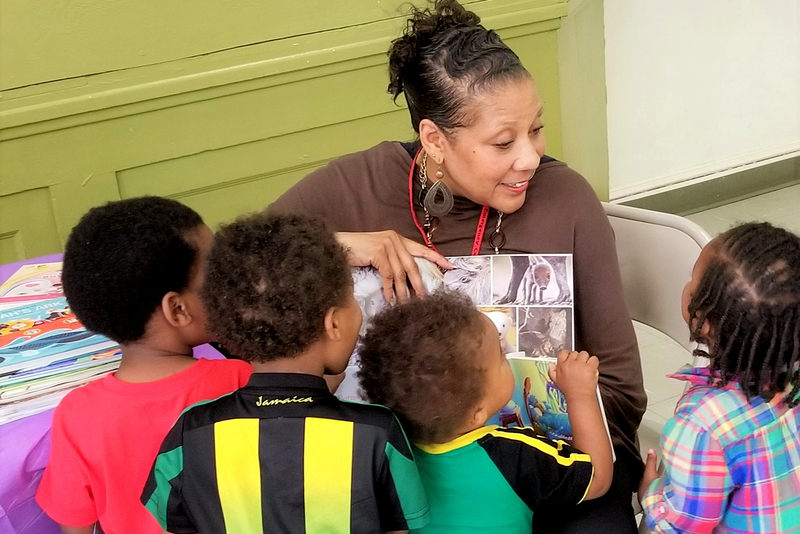 For now, once parents identify and enroll in quality childcare, BELL is not resourced to fund those fees or tuition, but another part of its mission is connecting qualifying parents to local and federal funding for pre-K care. BELL also invests in “discharge planning,” Edwards adds. Parents who move into more stable housing situations can still get guidance from the program when needed. “I don’t think there’s another model like the BELL project anywhere in the country right now,” Desmond says. They’re not able to say yet how many families they’ve served so far, but hope to have some numbers by the end of this year, as well as new “baseline data” for how many children are experiencing homelessness in Philly, and how many of those aren’t connected to ECE services. And BELL isn’t just about help right now. It’s about the future, too.